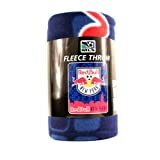 Support your favourite MLS team the New York Red Bulls home and away with our fan favourites officially licenced Major League Soccer throws. The fleece blanket throw is in the team colours and features the iconic New York Red Bulls logo in the centre. The Norwest Company blankets and throws are renowned for their style and warmth. This 50 inch x 60 inch (127cms x 152 cms)” throw is 100% polyester fleece. It is colorfast when washed as per the instructions and will remain soft, warm and durable for many years to come. It can be machine washed and tumble dried. This entry was posted in Sports Kits and tagged Blanket, Bulls, Fleece, Throw, York by All Kits. Bookmark the permalink.